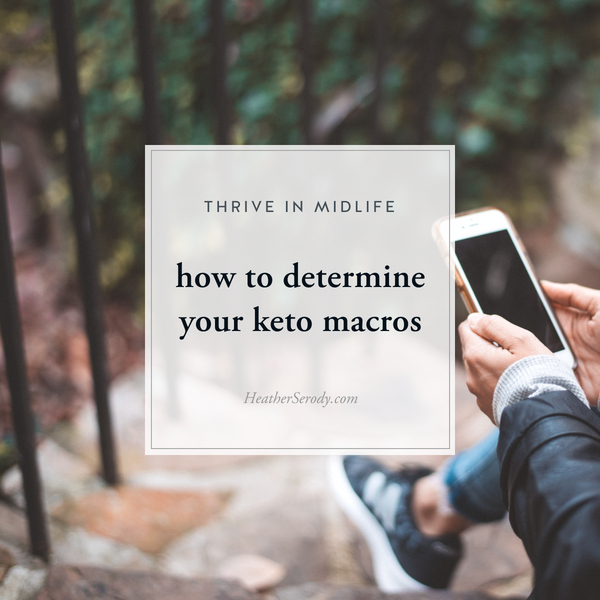 Go to the Macro Calculator on the Keto Gains webpage. If you do not have a body fat calculating smart scale then use the link on that page for how to visually estimate body fat. Then work your way down the page, following each instruction & filling in the information. At the end of the page, you will get your macronutrient goals based on your age, activity level, current body composition and goals. The latest research indicates that if you are new to keto and coming from a standard American diet that is high in dietary carbohydrate, that your body will likely have a higher tendency to create glycogen (carbs) from a higher protein intake. Our goal in eating keto is always to decrease a glucose (carb) response, so if this is you, my recommendation is to choose a protein goal on the lower range during the first 1-3 months of eating keto while your body is the adaptation phase. After you have adapted, you can feel free to start experimenting with higher protein macros and see how you do. On the Keto Gains Keto Calculator, take special note of your BMR or basal metabolic rate. This is the number of calories that your body needs to fuel each day without any extra exercise. The basic theory at work for all keto macro calculators is this -in order to lose weight, your total calories eaten must be less than your basal metabolic rate. Since your carbohydrates are always set to be less than 25 grams, and your protein needs also don't change, then it's your fat macros (grams) that decrease in order to run on calorie deficit in order to lose weight eating keto. If you are trying to gain weight, then you will eat MORE fat grams to induce weight gain. If you are trying to maintain then your calories should equal your basal metabolic rate. It really is that simple. Now that you have your macros, you need to plug them into My Fitness Pal and track your food in GRAMS. If you do it this was your calories will work themselves out naturally. If you're good and ready to set My Fitness Pal up, you can skip the rest and go here. Otherwise, read on to understand why in order to lose weight on keto your daily protein & carbohydrate macros never change, and you manipulate your dietary fat to either maintain, gain or lose weight. Unlike all other organs which happily run on ketones (fat) for fuel, your brain is an exception in that certain brain cells require glucose (about 50 grams per day) because those brain cells can't run on ketones (fat). This causes a lot of confusion and is why some say that you must fuel your brain's glucose requirements by eating carbohydrates, which turn into glucose in the body. But here's why that's wrong. If you are in nutritional ketosis, the process of converting fat (dietary or stored) to ketones will naturally produce 1 gram of glucose for every 10 grams of fat burned for fuel, which means that you will naturally produce enough glucose for your brain's daily needs while in nutritional ketosis (a fat burning state). The body has the capability and mechanisms for fueling itself without relying on you to eat carbs. Eating 20-30 grams of total carbohydrate per day is enough to trigger nutritional ketosis, produce your brain's daily requirement for glucose in the process, and keep most people satisfied with their diet. Keeping carbohydrate under 25 grams for (most) women is essential for triggering your body to run on fat for fuel. The body does have a daily minimum requirement for protein. This will vary depending on how active you are, how much muscle currently have, and if you are trying to build muscle. If you don't eat at least 30 grams of protein a day, your body will cannibalize the muscle you already have on your body in order to fuel its daily needs. So, you want to eat enough protein daily so that you don't lose muscle. To maintain muscle, leave protein ratio between 0.69 to 0.8. It is not recommended to drop below 0.69 or muscle loss may occur. Maintain my muscle is very important to me, so I personally use .9 to calculate my protein requirement. To gain muscle, the protein ratio should be between 0.8 to 1.2. You can find your lean body mass by using a scale that will tell you your body fat percentage. If you don't have a scale, you can guess by comparing how your body looks to these examples. Following your macros is THE KEY to successful weight loss with keto, but they are completely useless unless you track and log your food intake daily in a food tracking app like My Fitness Pal to determine how what you are actually consuming daily matches up with your macro goals. Now that you know your macros, let's set up your weight loss goal in My Fitness Pal using your macros.